As some of you may already know, Your Friendly Neighborhood Amoeba, and most of his neighborhood, have been doing without phone and internet service for much of the past week. Y’see, YFNA and his peeps live on this rather small island in the middle of the Salish Sea, Washington State, USA. And peeps who live on small islands don’t always realize to what extent the services they depend on hang, literally, by a single thread. Which is exactly what happened at 4 AM Pacific Standard Time on Tuesday, 5 November 2013. Plunging YFNA’s island, indeed his entire county, into the Now Generation’s equivalent of the Dark Ages. No cell phones. No landline phones. No email. No credit cards. No Google. No Wikipedia. No (ye gods!) Facebook. The men in Friday Harbor were starting to grow beards, wear black suits, and drive one- and two-horse buggies through the streets of town … Well, OK, maybe not that. But you get the idea. And things got bad enough for emergency service providers and local businesses to induce the county to declare a state of emergency, and for the communications providers to bring out the heavy artillery, pronto. 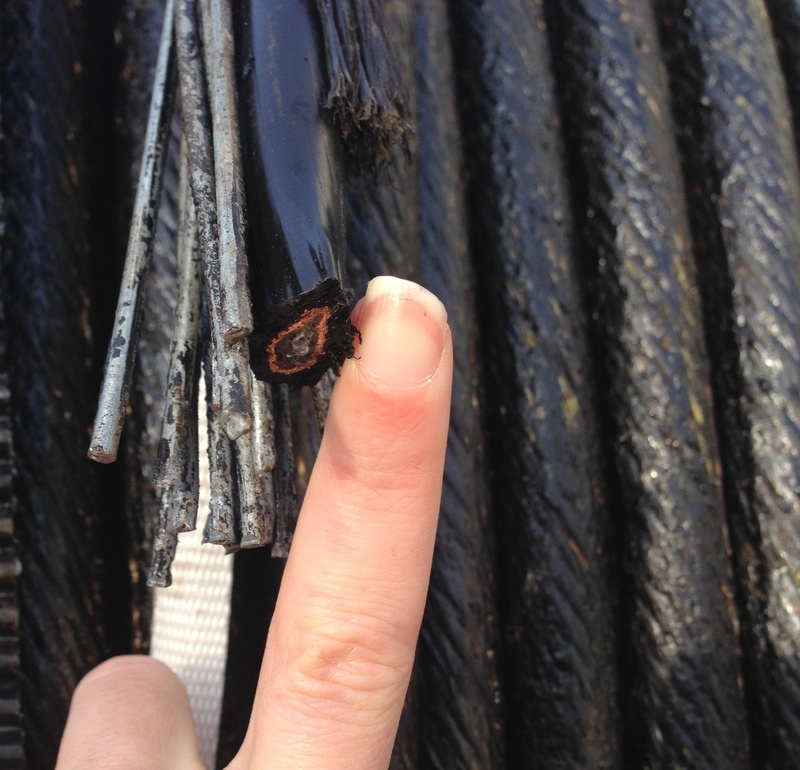 This afternoon (11 November 2013), those communications providers found the cut ends of the cable. And they did look pretty cleanly cut … what was that? Why did it take a week to find the broken ends? Oh. Did it get mentioned that the cable went under the ocean? That the broken bit was a mile offshore, in water at least 200 feet deep, in a region with strong (maybe 20 knot) currents, with the gales of November storms howling overhead? Any thug who thought he was going down there to do mischief, his body’s probably halfway out the Strait of Juan de Fuca by now. If the crabs let it get that far. No. The only vandal here is nature. And YFNA considers it fortunate that it took the cable guys only a week to find, never mind fix, the problem. The knife in question was a rock face, prominent in bathymetry images of the channel (where there’s a sharp demarcation between red = shallow water and green = deep water colors on the chart) near the point where YFNA surmises that the break took place. It remains to work out what caused the cable to move (it was found, YFNA reads, south of where it was originally placed) and in such a way as to turn a submarine rock face into a switchblade. Not least, so that, when they put the fixed cable back down, they can put it someplace safer. YFNA suggests that rock face plus 20 knot currents might well be both necessary and, in themselves, sufficient to explain what happened. But it’s also been suggested that a local earthquake, which happened late on 4 November, moments before the cable started sending out SOS signals (that was, presumably, about six hours before it failed), might have played a role. YFNA cannot dismiss that possibility, but. That earthquake was a little feller, with a magnitude of just 2.3. It was barely felt on land. How could such a small earthquake, all by itself, cause such a big problem? A map of earthquakes in the San Juan County region over the eleven months leading up to the cable failure shows a swarm of about 20 earthquakes of magnitude 0.5 or greater in the northern reach of the channel (San Juan Channel) between San Juan and Orcas Islands. The swarm may or may not be related to the generally-felt magnitude 4.1 earthquake of Boxing Day 2012; in any event, YFNA did not find evidence of a swarm of earthquakes in that spot in the months leading up to the Boxing Day event. 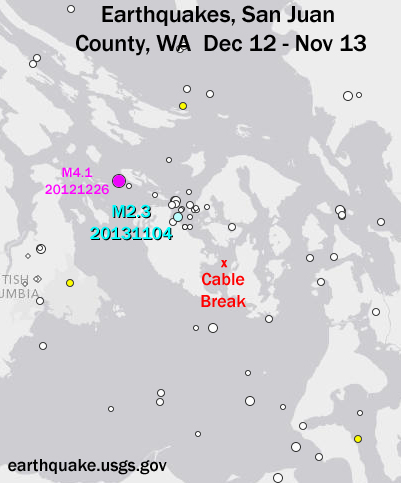 About four of those earthquakes were strong enough to be felt on San Juan Island. And the 4 November quake was the latest event in the swarm. 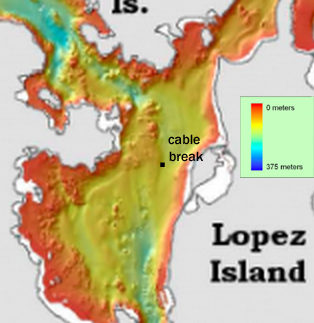 YFNA suggests that, while any one of these earthquakes may have been of insufficient strength to dislodge the cable, the cumulative effects of the earthquakes in the swarm, taken together with the strong tides and currents, and irregular bathymetry, of the site where the cable was laid, were enough to cut the cord and leave San Juan County without access to LOLcats. Tap. Tap. Tap. BOIINNGG! These ideas may or may not have merit; YFNA is prepared to be guided by those more well versed in geology and engineering than he is. But, well, here they are. Have at. This entry was posted in Amoeba's Lorica, current events, science and tagged Friday Harbor, phone and internet connectivity, San Juan County, San Juan Island, undersea cable. Bookmark the permalink.